Tood, Weetsie and Sybil the brides of rural Louisiana during 1943. Each young lady married one of the Cliffert brothers. The brothers currently off at war in which a local news story written about the wives left at home in Louisiana keeping the home fires burning intrigued the attention of Henry Luce. In which he decides that this story would make a perfect cover for Life Magazine. Kate Miller is assigned to the story. Kate has been focused on the way in Europe, though she is surprised to be asked to cover this story. “A woman’s piece”, something that Kate Miller had no interest in doing. Feeling that this would be a set-back in her career at Life Magazine, but she decides to accept the story as this will be her first cover story. Kate Miller is sent down to Sterlington, Louisiana to spend a week with the Cliffert women in her sophisticated New York attitude allows way for the sympathetic feelings as she begins to learn the background that this family holds near and dear to their heart. Kate comes face-to-face with her own powerlessness within a man’s world. The Cover of Life is filled with 1943 charm in today’s world. This show is deeply filled with an affecting story that will bring such struggle and self-worth to life and the realization that life can bring such bumps along the dirt road. "No matter how they may self-identify, every audience member will see themselves in the women in this play." 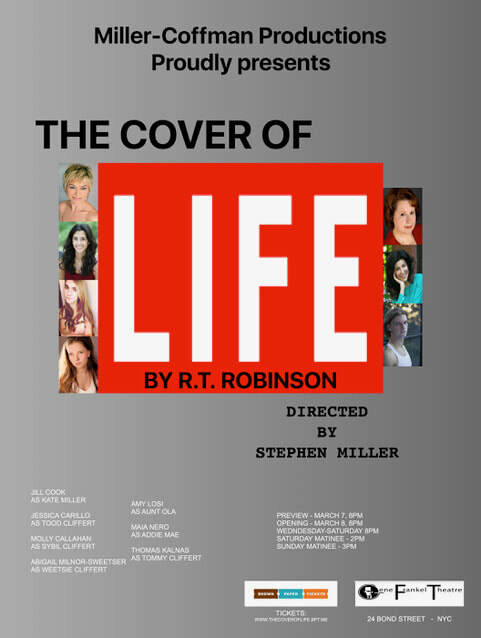 THE COVER OF LIFE had its world premiere at the American Stage Company, James N. Vagias, Executive Producer; further developed at The Hartford Stage Company, Mark Lamos, Artistic Director; David Harkanson, Managing Director.